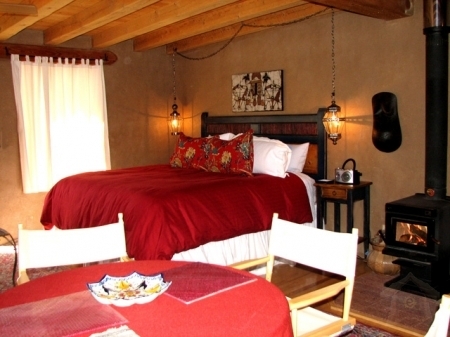 Casita Chamisa Studio- Romantic, secluded private setting on the scenic outskirts of the Town of Taos offers sweeping mountain views (a rare treat within the village limits). 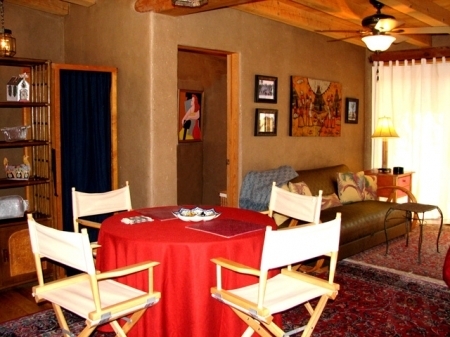 Packed with southwest ambiance accented with furnishings and art from the owner's world travels, a studio casita along with the main 1 bedroom house is a second home for the California owners who painstakingly made sure it is completely comfortable and livable for themselves, their friends and the lucky guests who find it on Premiere's web site. The efficiency kitchen offers compact stove, sink under counter fridge, coffee pot and microwave, pots, pans, utensils, dishes, glasses and flatware. 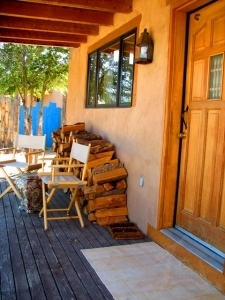 Casita Chamisa Studio's interior walls of "mud, straw and mica" enchant visitors from far and wide and are an intregral element of traditional hand crafted adobe homes throughout Taos and Santa Fe. 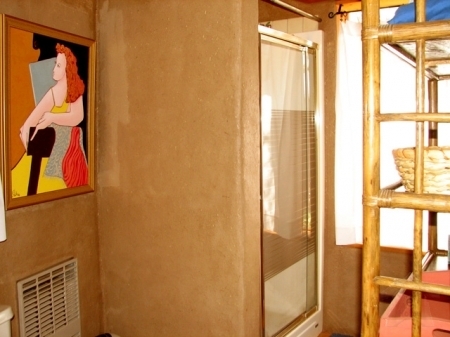 Offering soft inviting ambiance, Mud / straw walls have become an expensive option in new construction residences and are a rare find in vacation rental homes. 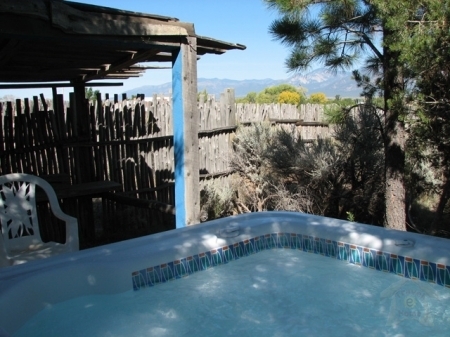 The very private hot tub nestled among a grove of Juniper is a few feet from the house and offers sweeping mountain views, a latilla hand crafted cabana and starry night skies. 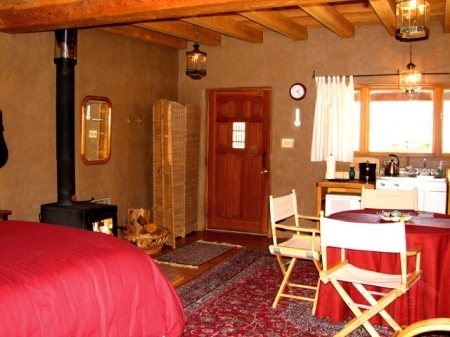 A nearby back road allows hikers and skiers direct route to Taos Ski Valley avoiding in town traffic to and from. 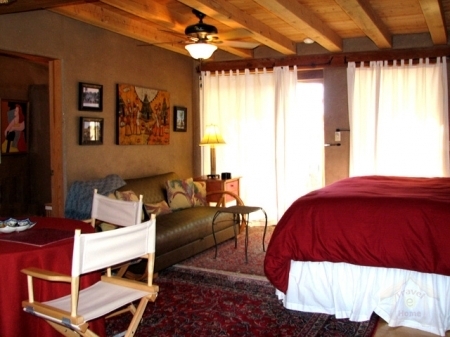 This in town private retreat has thrilled many repeat guests and insures new guests a most memorable Taos lodging experience. CANCELLATION POLICY: More than 30 days before arrival (60 days Xmas/NY\\\'s, Spring Break, and reservations of 14 or more nights) cancellation fee is 21% of total reservation. Less than 30 days before arrival, (60 days Xmas/NY\\\'s, Spring Break, and reservations of 14 or more nights) forfeiture of 100% of full reservation unless property is rebooked for entire stay at same rate. If booked for less, refund portion will be prorated (less the 21% cancellation fee). There are no refunds for late arrival or early departure. DEPARTURE: Property is to be left in good order by following the printed guidelines in each home. Should the guidelines be missing common sense should rule. Should property be left in poor order please read \\\"SECURITY DEPOSIT\\\" below. GUEST POLICY: Should there be more overnight guests (including children) other than number disclosed in contract (other than prior approved visits) the party will be required to immediately vacate the premises without refund and full security deposit will be forfeited. If a large party gathers without prior disclosure to \\\"Premiere\\\" the full security deposit shall be forfeited and party will immediately terminate.